A reasonable question to ask upon viewing any new Ridley Scott movie is: "is this the 'true' version of the movie or will there be an extended cut, director's cut be available on DVD in 6 months?" Director Ridley Scott, of course, is famous for adding director's cuts to his films, most notably Blade Runner and Kingdom of Heaven, but Alien, Legend, Gladiator and Black Hawk Down have also received alternate versions. 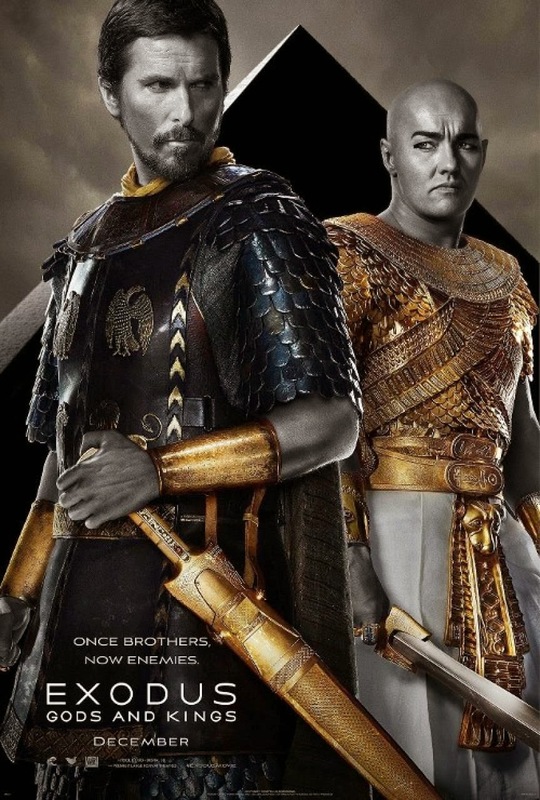 At first glance, nothing appears to be missing from Exodus: Gods and Kings, Scott's latest film which is based on the Biblical story of Exodus. All of the major plot points are here: sibling rivalry between Moses and his adopted brother Ramses, the slavery and emancipation of the Israelites and lots and lots of plagues. The film is gorgeous to look at and the scope is appropriately epic, yet somehow the film falls flat. Moses' character arc, and the whole film really, seem to be going through the motions. Moses' spiritual awakening seems to be pre-ordained by lore and the film's four screenwriters, rather than something that is earned by the character. While the Egyptian royalty is explored a bit, the Israelites aren’t given anything to do in the film other than build pyramids and be led away from building pyramids. To call them one-dimensional would overstate their agency in the film. The only interesting liberty the film takes is when there Hebrews hiding in basements from Ramses’ army, which immediately evokes the Holocaust. The ethnicity of the cast notwithstanding, there has been controversy of casting white actors to play Egyptians, the principal players do a fine job. Christian Bale stars as Moses with Joel Edgerton as Ramses. John Turturro, Aaron Paul and Sigourney Weaver appear as support characters. God Himself appears to Moses in the film in the form of a young boy. An interesting choice, but one that adds implications that were likely unintentional. Played by tween Issac Andrews, God appears more petulant than awe-inspiring. Screaming for Egyptian blood and brooding against thunderstorms, were it not for the Judeo-Christian context of the film, this boy could have been mistaken for demonic rather than divine. The violence in Exodus: Gods and Kings is something that is unavoidable, for sure. Unlike Scott’s Gladiator and Kingdom of Heaven, the violence has been sanitized for a PG-13 rating here. Worry not, bloodhounds, there are still stabbings, hangings, drownings and enough crocodile attacks to turn the Nile red with blood. At one point Ramses wants to challenge God to a kill-a-thon to prove who the better god is (Pharaohs you’ll recall were believed to be gods on Earth). The Abrahamic God wins, of course, pulling out infanticide as His trump card. Death by plague is rendered in glorious 3D for those who choose that format. Is there a version of this film that flushes out the characters more? Maybe. Possibly. Probably. Only the DVD will tell. The film as it appears in theaters fulfills its duties as a sword and sandal epic and as a reasonable blow-by-blow account of the Exodus. It does not, however, engage in a meaningful way with faith or God’s Covenant with man. There is something to be said about treating Biblical material with reverence and/or intellectual honesty, not as spectacle.